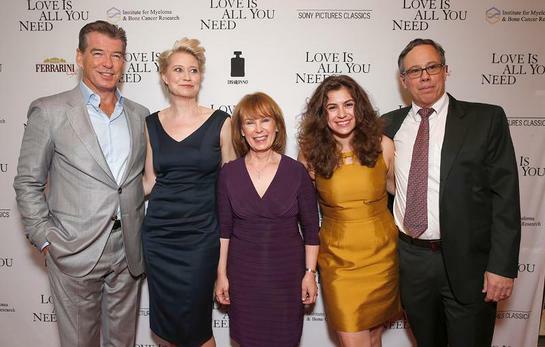 The Institute for Myeloma & Bone Cancer Research (IMBCR) today announced that its fundraiser last week Thursday, April 25th, for the premiere of Sony Pictures Classics’ new film “Love Is All You Need” starring Pierce Brosnan, was a sold out success. The event took place at the Linwood Dunn Theater in Hollywood, at the famed intersection of Sunset and Vine. Celebrated guests walking the red carpet included the lead actors Pierce Brosnan and Trine Dyrhold, the director Susanne Bier, saxophone star Kenny G, actors Aiden Turner and Amanda Lockwood, designers Malan Breton and Sue Wong, Artist Romio Shrestha, Tom Bernard, the Co-President and Co-Founder of Sony Pictures Classics, and IMBCR President, Medical & Scientific Director Dr. James Berenson and his wife and event chair Debra and their daughter Ariana, as well as IMBCR Executive Director Geoffrey Gee and advisory board members Tony Garzio and John Forrester. Upon arrival, guests had an opportunity to peruse and bid on items in the silent auction, benefitting IMBCR, which included donated items from the following fine organizations: ‘Lucid Junction’ life coach Regina Barang, Annie Skin & Body Care at Umberto Salon, Dr. Thom E. Lobe of Rejuveneda Medical Group, The Huntington Library, Art Collections and Botanical Gardens, La Costa Resort & Spa, X1V Karats, Ltd., The Pasadena Playhouse, Beverly Hills Lingual Institute, Clear Talent Group, Dr. Steve Liu, LAc, OMD & Feng Shui master, Golden Life Medical Group, American Cinematheque, Mallet Hill, Zina Sterling Silver, Bikram Yoga Silver lake, The US Grant, a Luxury Collection Hotel, Plantacion Properties’ ‘Casa Sirena,’ a luxury beachfront home in Costa Rica, designer Sue Wong, Temple of the Arts @ the Saban Theatre, Celebrity Personal Trainer Jason DeHoyos, Earth Bar’s Vibrance, Author Grace Robbins, ‘Cinderella and the Carpetbagger,’ Author Leslie D. Weinberg, ‘A Palm Beach Picture Book,’ Actress and Author Debbie Reynolds ‘Unsinkable: A Memoir,’ the Curve Hotel in Palm Springs, Jeff Field of Field Marketing, Republic eCigs, and Melody Korenbrot of Block-Korenbrot Public Relations donated several cast-signed “Love Is All You Need” movie posters. The benefit commenced with moving comments from Debra Berenson, highlighting the important accomplishments of the IMBCR research laboratory this past year in the quest to find a cure for multiple myeloma. Next up was Dr. Berenson, who acknowledged founding IMBCR board member Ron Rogers in the audience. Dr. Berenson spoke of the great improvement in patients’ quality of life, and ever increasing longevity- due to breakthroughs in his research laboratory. The next speaker was Tom Bernard, the Co-President and Co-Founder of Sony Pictures Classics, who gave the audience a little back story on “Love Is All You Need”, then introduced the Director Susanne Bier and Stars Pierce Brosnan and Trine Dyrhold. The audience, comprised largely of patients of Dr. Berenson and supporters of IMBCR, seemed truly captivated by the unrolling film on the big screen, “Love Is All You Need.” The plot revolves around hairdresser Ida (Trine Dyrholm), who had recently finished a successful breast cancer treatment, returned home to find her husband Leif (Kim Bodnia) cheating on her. At the same time, her daughter’s getting married at an Italian lemon plantation in a few days, and on the way there she bumps into Philip (Pierce Brosnan), the groom’s father. The characterizations are brilliant, the photography in Southern Italy gorgeous, and the audience resonated with the message for hope and love for everyone, even those facing life-challenging medical conditions. After the film, guests enjoyed a sumptuous After Party in the theatre foyer and lobby. Ferrarini Café of Beverly Hills (9622 Brighton Avenue) served a delicious assortment of spicy salami, prosciutto, mortadella bread bites, gourmet cheese samples including; parmesan, pecorino blocks and granapaddano, rock melon wrapped prosciutto, piadina, tuna peppers, Capri bites and a coffee and cannoli dessert bar. Special cocktails were created by Disaronno, including; The Stone Basil Sour, Spiced Disaronno Daisy and the Godfather Revised. Wine & Champagne was donated courtesy of Mionetto Prosecco, and water was donated courtesy of Hint Water. The event was produced by David Manning and the capable team at A-LIST Communications, who donated their services for the event. Event PR was handled by experts Rebecca Fisher, Alexandra Glazer and Melody Korenbrot of Block-Korenbrot Public Relations.